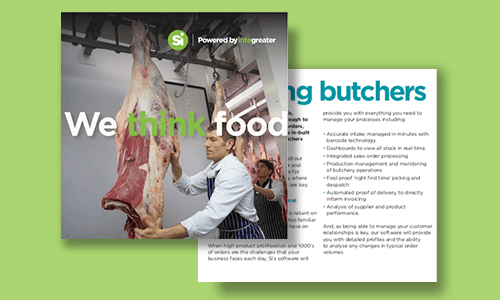 From managing boxes of primals, carcasses or factored goods through to proof of delivery against sales orders, SI’s Integreater software with its in-built flexibility, supports catering butchers and food service companies across the UK. At SI, we’ve applied our in-depth knowledge of this sector and specifically designed our software for this fast-moving catering industry, where traceability, QA and customer service are key. If your catering butcher or food service business is reliant on manual processes, you will be all too familiar with the impact human error can have on your operations. Accurate intake, managed in minutes with barcode technology. Dashboards to view all stock in real-time. Integrated purchase order and sales order processing. Recipe control and added value production. “Right-first-time” picking, packing and despatch. As being able to manage your customer relationships is key, our software will provide you with detailed profiles and the ability to analyse any changes in typical order volumes. Explore our specialist food software, which has already been implemented within some of the country’s most renowned catering butchers and food service companies. If your business operates within this fast-moving industry and would like to discuss how SI’s software and expertise will help you to improve efficiency, contact us to talk to one of our experts.